What does it cost to enter a horse in the Kentucky Derby? This is a pretty common question in my email around this time of year, so instead of answering it there I will just put it up for all to see. We all know it costs a lot just to buy the horse and train him up to the Triple Crown, but what exactly are the costs to nominate, enter, and run? First off, you have three different times you can nominate and, of course, the earlier you do it the cheaper it is. For 2009, if you nominated by January 24th it was only $600 to nominate a horse and make him/her eligible for all three Triple Crown races. That is why you see big name trainers with several nominees, to people at that level of the game $600 is pocket change. From January 25th to March 28th, it is $6000 to nominate and be eligible for all three races, still not too expensive if you have a talented late bloomer in your barn. After March 28th the nominations are closed and in the past that meant you couldn't get in the races no matter what. A few years ago they changed that to allow for supplementary nominations but the price is a hefty one. 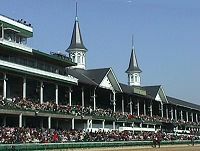 Until the Kentucky Derby it costs $200,000 to supplement and be eligible for all three races. If you wait until after the Derby, that goes down to $100,000 which will make you eligible for the Preakness and the Belmont or just the Belmont if you wait until after the Preakness has run. So there is no break in price if all you want is the Belmont, but at least the supplemental entry fees are added to the purse money. These supplementary fees are non-refundable except in the case of the Derby where it will be refunded if the race is over subscribed (more than 20 entered) and your horse doesn't get in the race. All horses nominated before the March 28 deadline get preference over supplements, regardless of earnings, when the field for the Derby is selected. The fees don't stop with the nomination. For the Kentucky Derby it costs $25,000 to enter and another $25,000 to start with a minimum $500 jockey mount fee for starters that finish beyond 3rd place. That means the cheapest you can get into the Derby (excluding normal costs like training, vet, transportation, etc.) is $51,100 if you nominate early. If you go in the Preakness or Belmont, it is $10,000 to enter and another $10,000 to start for each of those races. In addition to this, each owner entering a horse will get a big gift pack with jackets, hats, shirts, pins, and probably a bunch of other stuff related to the local area. At the Derby they also get free use of a car with a big Derby sign on the side, not sure if the other tracks do that one too. They will also get invited to tons of parties and other schmooze fests plus get the really good third floor clubhouse seats for the Derby. For many I guess these perks plus being able to say you had a horse run in the Kentucky Derby are enough to spend the $51,100+ it takes to get there. For more detailed information plus the forms to nominate a horse, check the Official Triple Crown website.